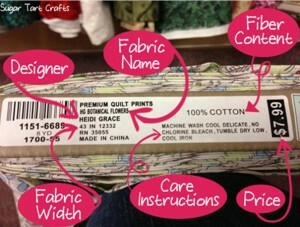 ALL fabric should be washed before sewing with the exception of fleece and “dry clean only” fabric. But no need to use laundry soap! All of our beginner projects are made with woven cotton (Flannel is a type of woven cotton.). Wash your cotton fabric in cold water WITH NO DETERGENT and dry in the dryer. DO NOT USE perfumed fabric softeners or dryer sheets! Fabric can shrink up to 3% when washed the first time. Some new fabrics “bleed” when washed the first time because of dyes used. No perfume products! When the fabric is ironed they become an irritant to nose and lungs. If you have respiratory allergies, it makes it hard to breathe. We have seen kids having a hard time breathing. It’s scary to see a child struggle to breathe if they are near the ironing board when the fragrance is intensified by ironing. SOLID COLORS: People flip fabric and sew the wrong pieces together. You have to mark right side and wrong side and sometimes it still gets sewn wrong. DIAGONAL STRIPE: Almost impossible to match the stripes. This never looks good on a beginner project and is frustrating. When you shop for fabric, look at the end of the bolt. There is so much information! Fiber Content is important. 100% cotton is the easiest fabric to start learning to sew with. Fabric width is also important. The wider the fabric, the more fabric you get per yard. Fabric Care (washing) instructions: If it says dry clean only, it is not a great choice for a beginner project of lounge pants! That’s all I can think of for now. I hope this clarifies concepts we have tried to explain in the past. If you have any questions or comments feel free to call, text or email me. I love to hear from you! I have not written a blog post in a while, but I feel compelled now as there are some subjects that come up constantly in our classes that I think are important. This blog post is dedicated our present sewing students and to future sewing students as well. Wash your fabric before sewing! With the exception of the fleece that we use for stuffies and fabric that says “dry clean only” all fabric should be washed before sewing. Our beginner projects are all done on some type of woven cotton. Flannel, by the way is woven cotton as well. When washing your cotton fabric, it should be in cold water with detergent (preferably unscented!) and dried in the dryer. PLEASE do not use perfumed fabric softeners or dryer sheets. There are several reasons for this. When the fabric is ironed, these scents and perfumes heat up and can be a real irritant to your nose and lungs. If you have any allergies affecting your respiratory system, it can make it hard to breathe. This is a real issue in our sewing classroom as we have seen in our classes some children have a hard time breathing being around any kind of fragrance…it’s scary to see a child struggle to breathe if she or he is near the ironing board when the fragrance is intensified by ironing. 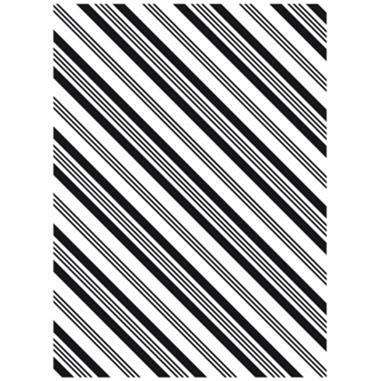 NO SOLID COLORS. The problem with solid colors is if you don’t carefully mark right side and wrong side, people end up flipping the fabric around and sewing the wrong pieces together. What a mess! We have seen this on lounge pants (both kids and adults have made this mistake) and it is a disaster! 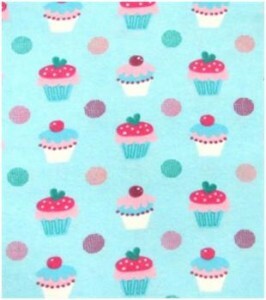 ONE-WAY DESIGNS there are some very cute fabrics with a one-way design, so just buy an extra half yard to a yard of fabric. That way we have enough fabric to lay it out so everything is facing the right way! 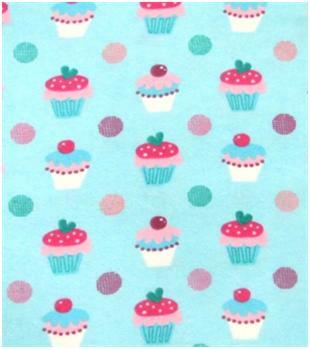 Example: picture of cup-cakes… if you turn it one way the cupcakes face up, but if you turn it another way they are upside down and if you turn it sideways…well, the cupcakes look pretty odd! When you shop for fabric, look at the end of the bolt and you will find all kinds of information. There is so much information on the end of the bolt! Look at the picture below. That’s all I can think of for now. I hope this clarifies concepts we have tried to explain in the past. If you have any questions or comments feel free to email me. I love to hear from you! I recently had the opportunity to speak with Rebecca Szetela for Learnivore’s “Most Interesting People in the World” series. She is both the owner and sewing instructor in the fast-paced, creative environment she has developed at Create! Sewing Studio in Acton, MA. Q: What are the basics of “repurposing”! A: First you need to know where to find clothing for repurposing. Your own closet plus thrift shops & ebay are all good places to find vintage fashion! Let’s start with your own closet. Do you have clothing that feels out of fashion or dowdy? Could it use a make-over? Think about how you could re-work what you already have. Next…thrift shops! Shop regularly as the selection is always changing. Found something you like that fits your budget? Buy it now, it may not be there later! Try things on. Wear clothing you can slip an item over to see if it fits. Look for quality fabrics. 100% wool sweaters can be a find, but watch out for furs or leather. Furs can be dried out & brittle or need expensive cleaning. It may sound funny, but smell your items. Don’t bring mold & mildew home! Ebay is another great place to look for vintage fashions. You can find amazing items, but check sizing carefully. Actual measurements are helpful! Also, the price may be great, but remember to add shipping charges to your final cost! Repurposing is a lot of fun, good for the environment & can expand your wardrobe in a totally unique way! New + “Repurposed” = Great Style! sweatshirt is all new marbled purple fleece, but her gorgeous jeans are repurposed! of top & pants into a super cool & updated look! I am so inspired this week! Sunday We produced our first ever Create!® Sewing Studio Fashion Show at St. Matthews UMC here in Acton. Tuesday Business coach Deb Laflamme taught a group of local business owners (including yours truly) all about the new stuff coming down the pike on Facebook. Thursday I actually wrote, designed and sent out an email newsletter for the first time in a year! So… enjoy the Spring weather, but don’t forget to also get Create!-ive! We are glad our students love learning here, because we love what we do! 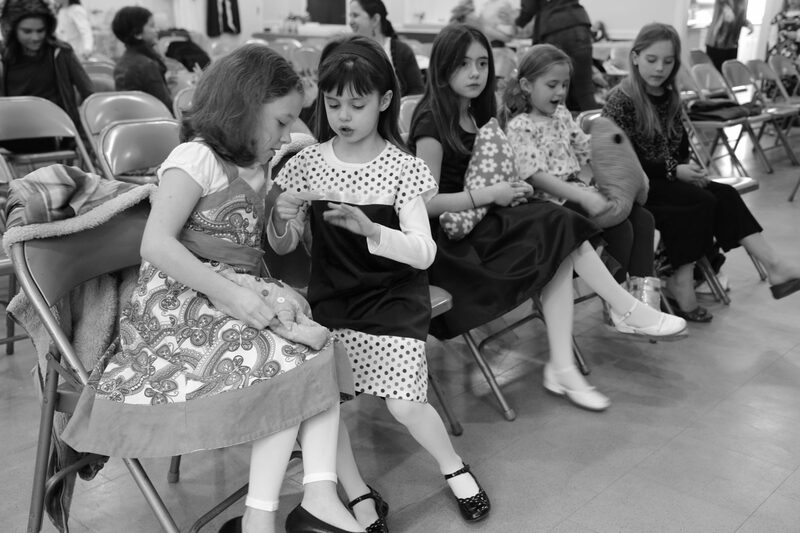 Fashion Show Models waiting for their cue. Follow “createsewbecca” to see our images. 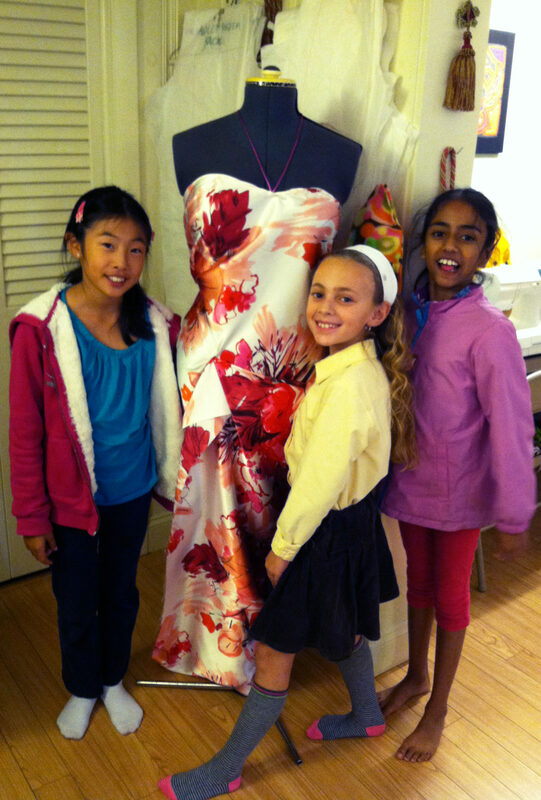 Young sewing students gather around the dressmaker form to get their picture taken! I was thinking today about why I do what I do. My dear friend, Lorrie visited today from California with her daughter, Katie and I gave them a tour of our sewing classroom. As I showed them some of the projects our sewing students are working on we talked about creativity (Her daughter also has a creative background.) and sewing and what is important to us. The thing that started me in this business of teaching people to sew is my passion for creating. It’s why I named our sewing school Create! and it’s what gets me excited every day. Watching our sewing students literally leap into the classroom (the kids) to get to their sewing classes and seeing the intense joy as they learn to sew wonderful clothing and bags and stuffed animal and (for the adults) incredible valances and home decorating projects as well is a daily inspiration. As we expand our classes and offer more and more of what our students want, it’s good to remember why we do what we do. It’s the love of creative expression and it’s a blast! What are Pig’s Toes? Here at Create!® Sewing Studio, we have renamed a part of the sewing machine. “Pig’s Toes” is the name we use for the Presser Foot. The reason for this is simple. We do it for safety reasons! The first time I told a student to put her Presser Foot down and she “pressed her foot down” I knew we had a problem! 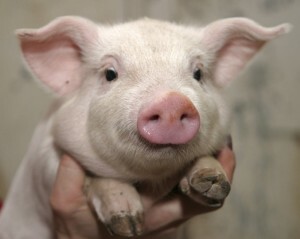 Then when I found a source that called the Presser Foot “Pig’s Toes”, I hoped that this would solve our problem. Find me a girl who refers to her feet as pig’s toes! After over 5 years of teaching kids, teens and adults how to sew…I think we made the right choice! What do you think? Continuing our discussion of the parts of the sewing machine, let’s talk about the “Take-Up Lever”, fondly know here at Create!® Sewing Studio as the “Goose” … a very important part of the sewing machine. The goose is controlled by the handwheel and the position of the goose is important. Have you ever tried to take your fabric off the machine after stitching only to find that you yank and yank and it’s hard to get the fabric off the machine? Well look no further than the position of the goose. If the goose is not in the top position when you are ready to take your fabric off the machine, you run the risk of breaking your machine! To remove your fabric easily, the machine’s rotary mechanism has to go through it’s full rotation (ever thought about why it is called a “rotary machine”?). The indicator that the sewing machine has gone through it’s full rotation is the goose being up. If, when you finish sewing your seam the goose is not up, turn the handwheel toward you until it is. That completes the rotary stitch. Your sewing machine (and you!) will be much happier! An additional benefit of paying attention to the position of the goose is that when you finish your seam and you go to stitch your next seam, you won’t pull your thread right out of the needle! Have you ever wondered why you are constantly having to rethread your needle? Well, this may be why! 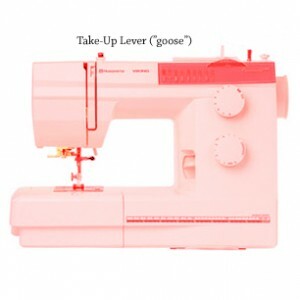 So pay attention to that goose and you will have a happier sewing experience! By the way, the reason we call it the goose has to do with the next part I will write about….the Presser Foot (or “Pig’s Toes”)! See you soon! In this series of articles, I thought it might be helpful for those of you who would like to expand your knowledge of sewing, to talk about the parts of the sewing machine. The first part I will discuss is the hand wheel. 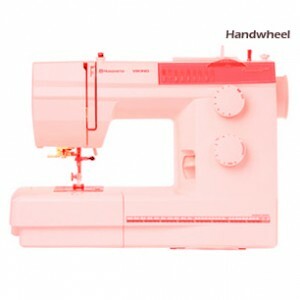 The hand wheel is an important part of the sewing machine. Although most sewing enthusiasts love the power of the electric sewing machine, there are times when knowing how to do some of your stitching manually is really helpful. On most modern electric sewing machines the hand wheel (that “bump” on the right side of your sewing machine) is turned toward you (counter-clockwise if you are looking at the machine from the right side of your machine) to take a manual stitch. The times you use the hand wheel to make a stitch include when you want to turn a corner on your project (called a pivot) and you need the needle in the fabric to do this. So…you turn the hand wheel toward you till the needle is in the fabric, lift up the presser foot and turn your work. Then you put the presser foot down and continue to stitch. Another time you need to use the hand wheel is if when you come to the end of your stitching if the take-up lever is down. You need to turn the hand wheel until the take up lever is in the topmost position in order to complete your stitch. Another time you use the hand wheel to stitch a manual stitch is at the end of a dart. I will talk about dart construction in more detail in a later blog post, but this is an important instance of using the hand wheel to make a manual (non-electric) stitch.